Koala in tree feeding (Image: Dr Ben Moore). Koalas feed on a very select range of eucalypt species. In some regions, koalas may only feed on one specific species of eucalypt, where as in other regions their diet is more diverse and they may browse on several species. Overall, koalas are very selective about the species and the individual trees that they will eat. 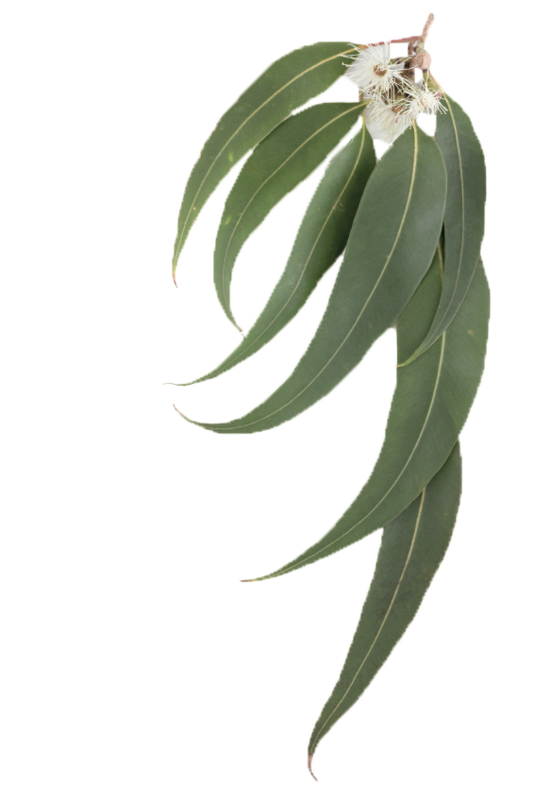 To digest eucalypt leaves, koalas rely on the help of bacteria in their digestive systems that help them to break down the tough, nutrient-poor leaves of their preferred tree species. 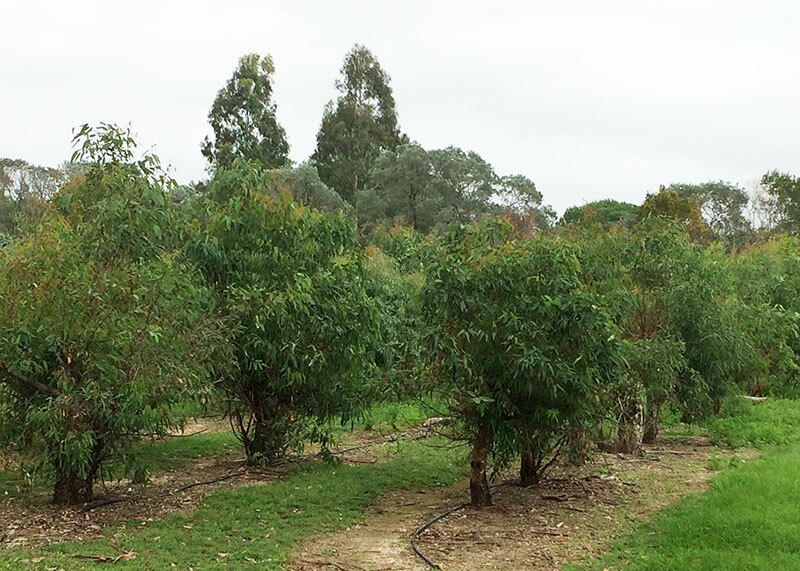 This research is asking whether these microbes may help koalas deal with the tannins present in eucalypts and help them cope with changes in the chemistry of the plants they eat. In some situations, koalas are moved (translocated) into new areas to rebuild local populations and to manage their impact on environments in which they have built up large numbers. Koalas are also sometimes administered with antibiotics to help them cope with common bacterial illnesses like chlamydia. These antibiotics can ensure that koalas overcome illness but they also affect the microbes in the gut which may then impact on the animals' ability to obtain sufficient nutrients from its food. On occasion, faecal transplants are used to recolonise antibiotic-treated koalas with cultures of gut bacteria and microbes from healthy koalas so that a more suitable gut microbial community is re-established. However, the effectiveness of these treatments and best practices for establishing what is accepted as a 'successful' microbial culture is subject to debate. A complicating factor is that many gut bacteria in koalas are difficult to culture outside of the digestive system, so this research will use the latest technology in sequencing and genetic analysis to compile a database of the types of bacteria present and their genetic functions so that we can understand the connection between food types, bacterial communities and koalas' health. 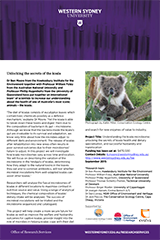 Dr Ben Moore and collaborators from universities, government and industry will determine how koalas' microbial communities change in response to different types of food, changes in the environment and over time and in response to chemical changes in the major eucalypts that provide food for koalas. The research team will collect leaf and faecal samples from diverse and distinct areas to assess how variation in feeding patterns affects the composition of microbes in koalas' digestive systems. How hindgut microbial communities change when exposed to tannins and natural toxins found in eucalypts such as oxalates, phenolics and terpenes, and common antibiotics. 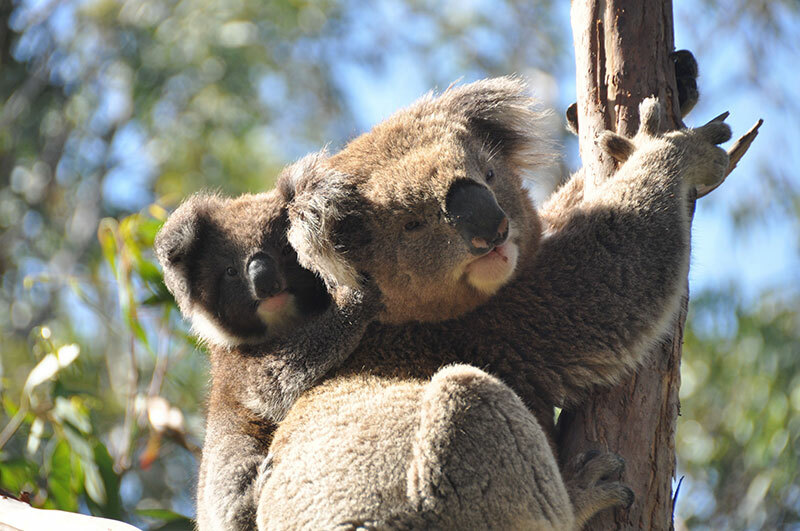 Whether applying inoculations from well-adapted koalas into translocated koala populations can effectively result in modified gut microbial communities and whether these changes then enable koalas to eat unfamiliar types of leaves in new areas or in captive environments. Whether we can determine which genes enable the right kinds of digestive enzymes to help koalas digest tough foods and whether there might be industrial or commercial applications from being able to use these enzymes in other applications. Overall, the research aims to ensure the future wellbeing of this iconic Australian animal species, enabling us to manage koala populations in the wild to prevent over or under-population, and to be able to ensure that our koalas have a bright future even under changing environmental conditions. 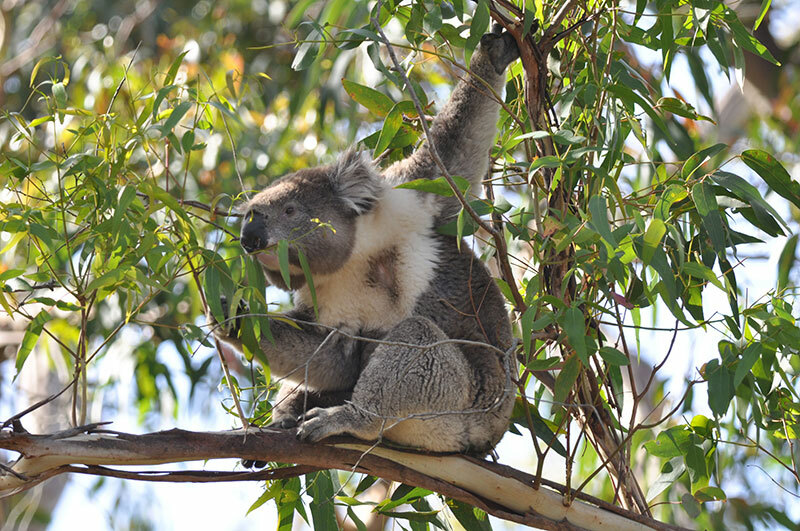 The research will provide a collaborative understanding of the very unique interactions between Australia's eucalypts, the koalas that feed on them, and how the living biome of microbes in their digestive systems influences koalas' ability to consume Eucalypts as food. With insights from this research, Australia's koala populations can continue to be safely managed in the face of habitat change. Image credit: Dr Ben Moore. This project P00021901 "Understanding the koalas microbiome: unlocking the secrets of koala health and dietary specialisation, and successful husbandry and translocation" is funded by the Australian Research Council (ARC) with linkage funding from the Office of Environment and Heritage and Evolva Biotech A/S.